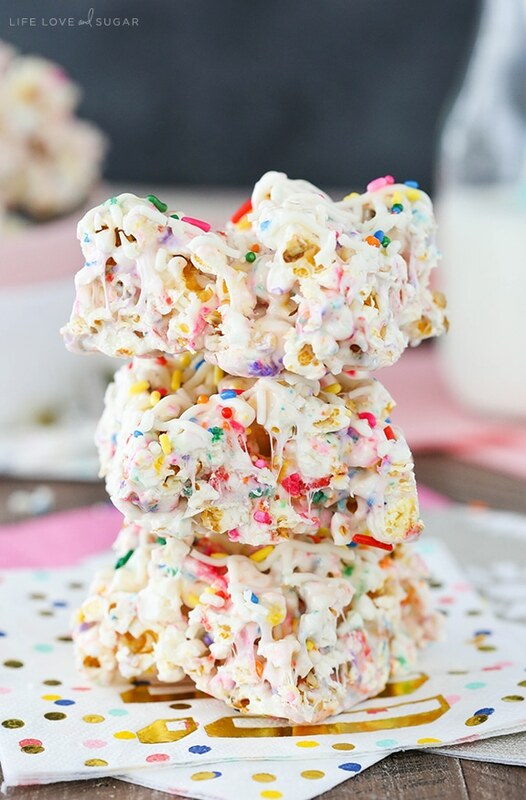 These Funfetti Marshmallow Popcorn Treats are a super fun twist on rice krispie treats! 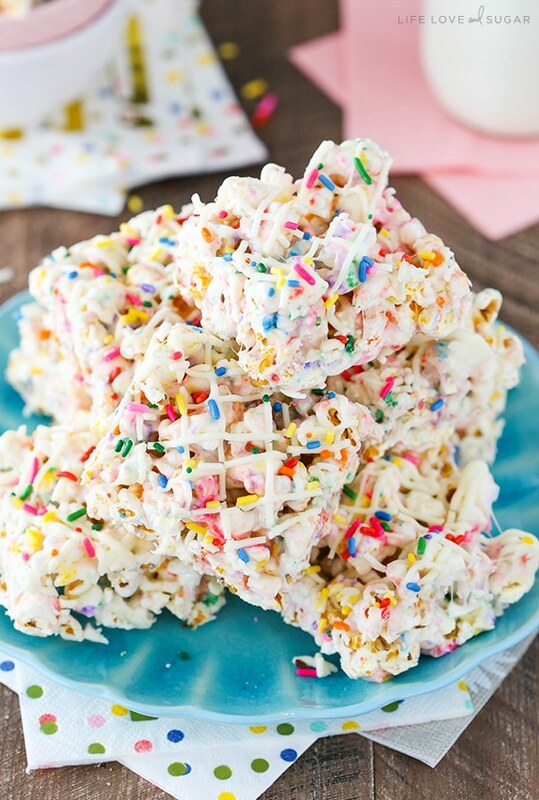 With popcorn, marshmallows and loads of sprinkles, it’s sweet and salty at its best. It starts with Christmas. My dad loves the gift-giving part of Christmas. He could care less about receiving, but giving he loves. And I totally get it. It’s super fun to give something to someone when you know they are going to love it. But he also loves having as many things for people to unwrap as possible. It has always made for long gift openings at Christmas (which was quite fun). It also means that if you are getting an outfit, each piece will be wrapped separately so that there’s more to open. This process of gift opening has become known as “building.” And it’s a pretty regular joke. For example, if someone opens a pair of pants the next comment is often, “We’re building!” with a big smile on your face since you’ve just so cleverly poked fun at my dad. It’s all in good fun, of course. So think of these treats as “building.” It’s just one part of what will ultimately be a finished product. To get the complete “gift” – if you will – you’ll have to check back on Wednesday. But just like a pair of pants can be worn either with the shirt they were gifted with or used on their own, so can these treats. But these really are good. 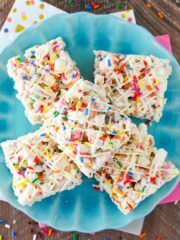 They are a fun combo of sweet and salty and make a great treat or snack. 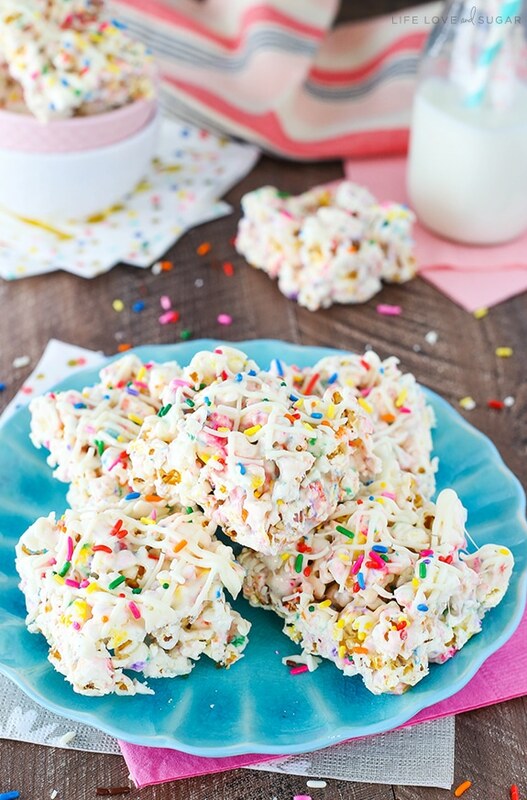 They’re no bake, which puts them high on my list of go-to quick options. And they’re popcorn. Who doesn’t love popcorn? I used a bag of one of the new skinny popcorns, but you could totally pop your own if you want and have a more salt-y popcorn in yours. In fact, I typically encourage plenty of salt on my popcorn, but that’s a story for another day. 1. Grease a 9×13 baking pan. 2. Add marshmallows and butter to a large pot and melt over medium heat. 3. 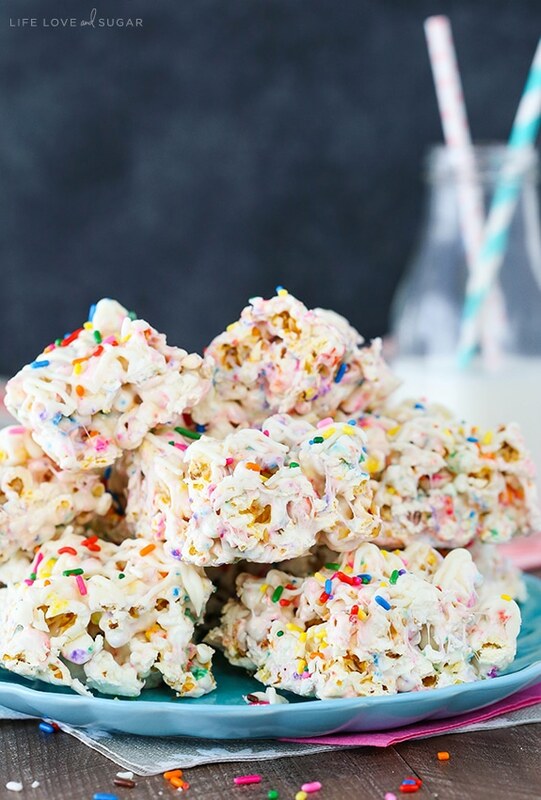 Once melted and smooth, stir in the popcorn and sprinkles until well coated, then immediately pour in the baking dish and press into an even layer. 4. Add white chocolate chips to a small microwave safe bowl and melt in 15 second increments until melted and smooth. 5. 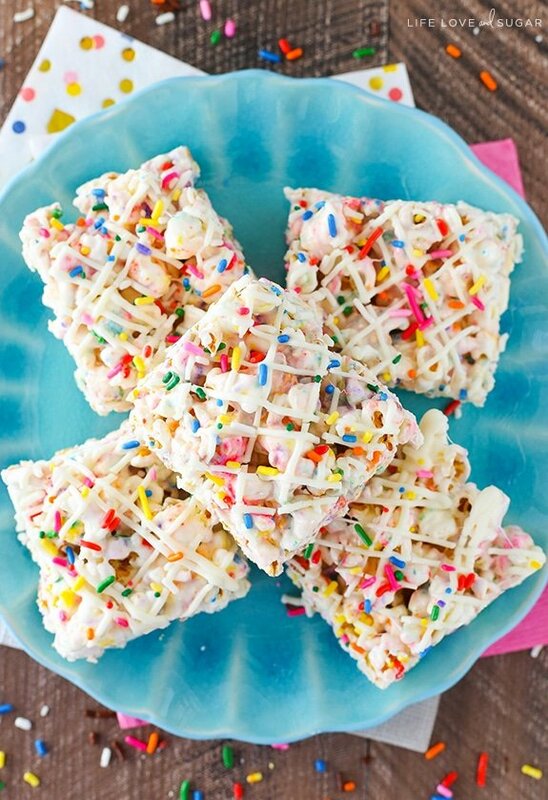 Drizzle white chocolate over the popcorn treats. 6. Let sit until cool and firm, then cut into bars. 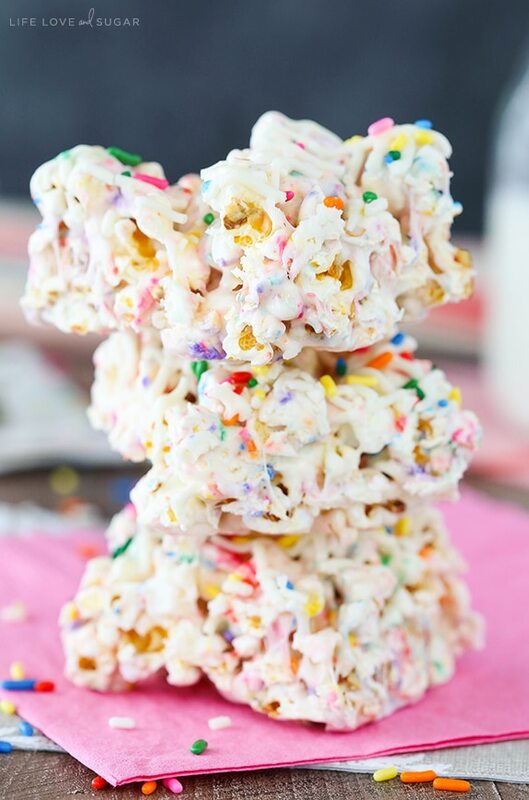 Feel free to use as salty of a popcorn as you like, but a really buttery and oily popcorn can prevent the marshmallow mixture from sticking so a butter-free popcorn is best. These look like so much fun! So cool to hand out as birthday treat. Sometimes we gotta make the treats our family loves, and not our favorites. But hey, these look absolutely incredible. 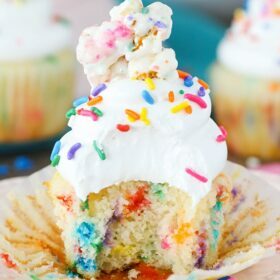 I love the drizzle on the top! Hi Lindsay! My 10 year old Olivia and I have discovered your website just recently. 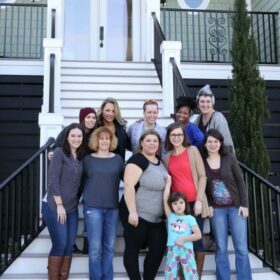 We have made many of your cupcake recipes. We find them to be easy to make and come out perfect just about every time! Thank you so very much! Can I use marshmallow fluff for this recipe? Same amount ? I’m so glad to hear that! Thanks Gabrielle! Marshmallow fluff actually won’t work for this recipe. You’ll need actual marshmallows.